So, you’ve purchased a brand new bread maker and set out to create the first of many Pinterest-worthy loaves. For many people… the first attempt at using a bread machine results in a loaf that doesn’t quite go to plan. It could be the consistency of the dough, a collapsed crust, or a bread that fails to rise. Many things can — and do — go wrong. That’s why we’ve put together this guide. 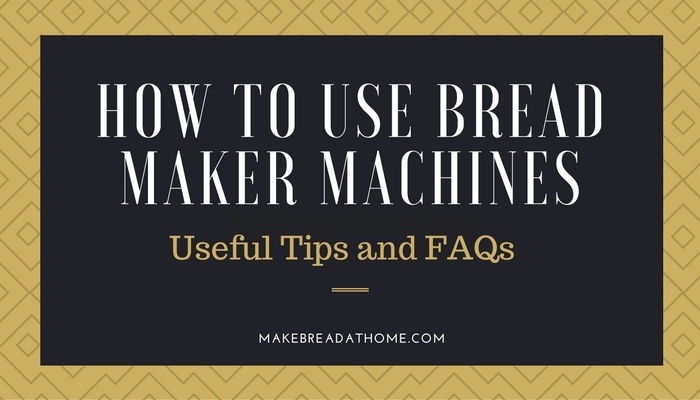 It is a compilation of tips and FAQs for getting the most out of your bread maker from Day One. 1. Get to know your bread machine before scouring for the latest recipes. Time and time again we hear from readers who’ve just received their bread maker, rushed through the instructions, gone online to find a recipe… and promptly baked the ‘World’s Worst Loaf of Bread’. Each bread machine has its own quirks; both those outlined in the instruction manual, and those that only become apparent after several runs of testing. We recommend sticking to the recipes that come with your machine’s instruction manual for the first several loaves. Establish a baseline of what your machine is good at and get a feel for the different settings. You will probably spend most of the time running Basic cycles — resist the rapid baking options until you master Basic! Note: Of course, if you’re going to follow online recipes, it’s a good idea to copy those created by owners of the same machine. 2. Add ingredients in the correct order. You don’t want to get this wrong. Adding ingredients to your machine’s basket in the wrong order can result in poor quality loaves. 3. Make sure the yeast avoids direct contact with salt and sugar. So important it merits repeating. If the yeast gets jumbled in with salt and sugar, the yeast will lose potency and the mix will lose its balance. Mixing yeast and salt is a big no-no. 4. Pay close attention to the form and texture of the dough. While it’s true that using a bread machine simplifies the process of making bread, if there is one skill that you should really learn… it’s the ability to tell good dough from bad dough. Once your machine starts mixing, don’t be afraid to interfere if the dough looks either too watery and moist, or too dry and flaky. With experience, you can tell a good loaf in the making from a bad loaf by the texture of the dough. If it looks too moist, add extra flour one spoonful at a time. If it looks tough and stodgy, add extra warm water one spoonful at a time. Rinse and repeat until you have a nice elastic ball-shaped dough mix. Many bread machines come with viewing windows where you can observe the mixing/kneading process. If you don’t have this luxury, or you can’t tell the dough’s consistency, open up the machine and test it with a finger. 5. Add extras near the end of of the mixing process — not at the beginning. There are many optional ‘extras’ that you will no doubt want to test in your bread at some point. Some of the smartest bread maker machines, like the Breville BBM800XL, come with automatic dispensers that release your extras in to the dough mix at the optimal time. If you aren’t lucky enough to have one of these machines, the best advice we can offer is to wait until your dough is forming a firm, elastic ball towards the end of the mix before adding the extras. 6. Keep the weather in mind! Things like keeping ingredients at room temperature and the local humidity can have a huge effect on the quality of your bread. For example, high humidity softens the dough and allows it to expand more freely, which brings a much greater chance of the bread collapsing. If it’s a rainy day, or humidity is high, or there is more moisture in the air, then you should go with a slightly drier dough to offset this imbalance. Humidity also affects the reaction of yeast, since it lowers the concentration of alcohol and sugar in the mixture, causing a faster reaction. Higher humidity = Less yeast required. This is a delicate matter since too little yeast and the bread won’t rise sufficiently, but too much and it risks collapsing. In both cases… an unflattering loaf results! For consistency, aim to have ingredients at room temperature before you start. If you are using eggs from the fridge, a good way to get them to room temperature is to gently warm them in a cup of water. 7. Cut butter and margarine in to small chunks. When using butter or margarine, be sure to cut it in to small pieces before adding to the basket. This will improve the consistency of the mix, especially when using a less powerful bread maker. 8. Want quality bread? Buy quality ingredients. The way you have to think about using a bread machine is that it is just like any other tool. If you want to produce delicious mouthwatering bread of the ‘artisan’ quality, then a good bread machine alone is not enough. You must have quality ingredients that are well suited to your recipe. Bread flour is better than all purpose flour. It is made from hard wheat which has more gluten and wheat than all purpose flour. Use it if you can. Low quality (or expired) yeast will stop the bread from rising. Many readers ask why their bread didn’t rise and the answer is usually one or a combination of A) the yeast came in to contact with salt/sugar, B) the yeast was expired, or C) there wasn’t enough of it. Be careful using the delay timer with fresh ingredients. Ingredients like milk, eggs and cheese are not designed to be kept at room temperature for hours on end. They may spoil, or worse, increase the risk of food poisoning. Got any questions about using your bread maker? Any advice to add to any of the points mentioned above? Let us know your comments, thoughts and questions below!